Cassie is a lovely blue ex-racing greyhound who was born on the 18th April 2007. 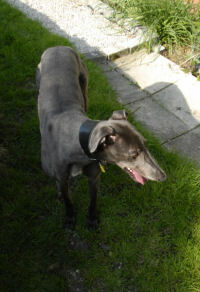 She is spayed, inoculated and microchipped, walks nicely on the lead and travels well in the car. 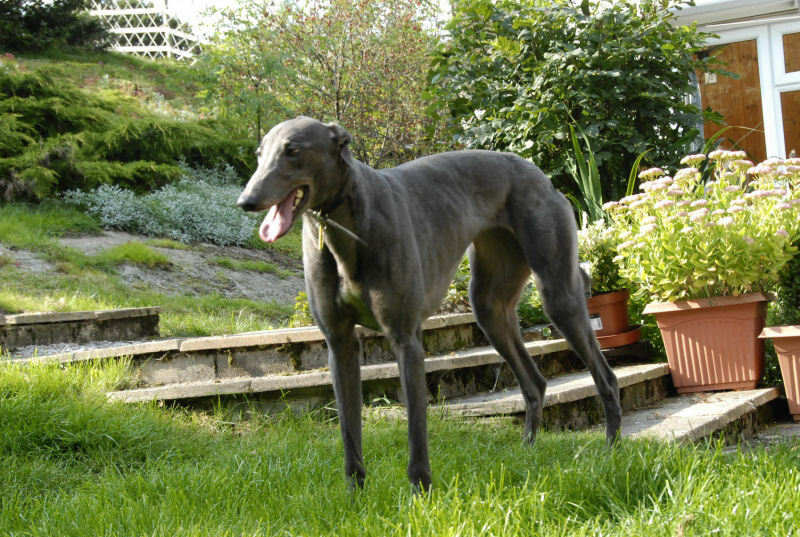 Stuart collected four greyhounds this morning, one of which was Cassie, although she didn't know that was her name at the time. When they arrived home I'd already put ours behind the kitchen gate so all the new ones stayed in the kitchen, but before we brought them inside we walked them around the garden to do their toilet then fed them and walked them around the garden again. Back inside Stuart sat in the kitchen and did some work while I finished the guest bedrooms then I came down to help him. Having four new greyhounds in the house was rather hectic and thankfully doesn't happen too often. Just before Cassie's new owners came to collect her we took her in the garden and took a few photographs of her.